Zeus III is surely going to blow you away as the WMS Gaming slot game is the first slot by WMS to use Reel Boost technology. With 6 reels and 192 paylines, you can play from 40p a spin to £120 a spin. This is the third Zeus slot to be produced following huge success in land based casinos in particular. Based on the God of Sky and Thunder, Zeus III is also very much loved in casinos across the States and will surely become a huge online hit. 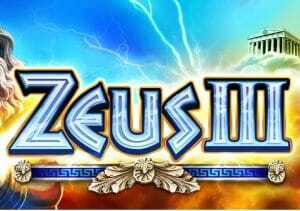 The original Zeus is a landmark slot with Zeus II being a Facebook-developed game so Zeus III will surely become one of the most popular online slots in time. It has unique features such as the Free Spins feature which can be played when you get 3 or more Coliseum symbols on consecutive reels (only 2 to 6). You will get 10 free spins for 3 symbols, 25 free spins plus 10 times your stake for 4 symbols and 50 free spins plus 50 times your stake for 5 symbols. The reel layout ‘flips’ from the base game as you will see the reel layout reverse effectively thus giving you more chances to win multiple wins per free spin. You can also trigger more free spins by getting 3 or more Coliseum symbols during the feature (i.e. as mentioned above). Look out for the Zeus symbol on the reels as these nudge to fill the entire reel thus making it wild – this is the Nudging Wilds feature. Look out for the Zeus III logo symbol as these change into a Nudged reel giving you wilds. Your bigger wins will come if you get 3 or more wild reels. Most wins (totals not big amounts) will come from the base game (57%) but the bigger win amounts should come from the Free Spins feature. The key to winning big in Zeus III is wild symbols. The game is a high variance game from my experience – I’ve already managed to win over 350 times my stake in the Free Spins feature – I did start off with 25 free spins and got a further 10. Then I got 3 wild reels on 4 occasions to win that amount. If you like high variance slots, you can’t go wrong with Raging Rhino or Viking Vanguard (both by WMS).